If you're attending your first wine tasting or are just beginning your wine education, a wine tasting wheel can be a very helpful tool. Even some expert tasters use these wheels to help them find words for the tastes and aromas they experience in a wine. What Is A Tasting Wheel? A tasting wheel is a diagram of the many flavors and aromas you may notice when you taste a glass of wine. Although there are several different designs, you can expect to see a section for the nose portion of the wine and a section for its flavor. The wheel usually features different colors for each type of flavor or scent. 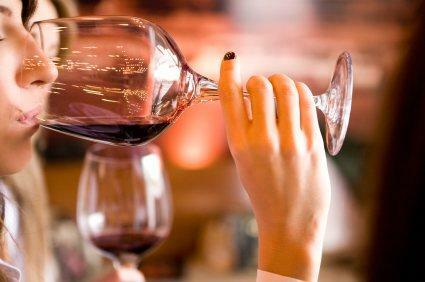 Start by holding your glass of wine up to your nose and inhaling. Think about the aroma of the wine. Now look at the tasting wheel. Find the words inside the first ring of the wheel that best describes the wine's aroma. Is it woody or spicy? Is it floral? It's likely that several of the words will apply. For each word, look at the next ring of the wheel to further refine your description. If it's woody, is it a musty type of woody? Finally, follow the descriptive word to the next level of the wheel. This will give you an even more specific description for the aroma of the wine. When you've settled on a good word, write it down. Do this for each word that applies to the wine's aroma. Next, take a sip of the wine, and hold it in your mouth for a few moments before swallowing. You'll probably sense several different flavors. Use the wine wheel in the same way you did for the aroma. Be sure to write down each word that describes the taste of the wine. When you're done, look at your list. This is how you can describe the wine to another person. For fun, compare your list with others to see if you had the same impressions. You may be able to buy a tasting wheel at your local wine shop or the nearest winery. You'll also see these diagrams in wine tasting books and kits. If you find that you love using a tasting wheel, but you can't always find the word you need, consider making your own. This can be a fun project for a wine tasting party or other wine-based event. If you'll be hosting the party, make up blank wheels ahead of time, and give guest supplies to write the appropriate words in the blanks. Be sure to have markers on hand so they can color code the wheel according to their own tastes. Whether you make your own wheel or use one of the examples you find online, you'll love how these helpful diagrams take the guesswork out of wine tasting.